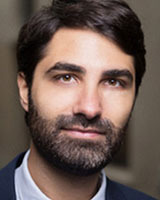 Borna Scognamiglio is the CEO and co-founder of Pixis. A former researcher at the Paris-Sorbonne University, he holds a double Bachelor’s degree in Cultural Heritage and Cultural Management and a Master’s degree in History, as well as diplomas in entrepreneurship from ESCP Europe and Design thinking from École Centale, Lyon. He is the founder of a network of Italian researchers in France and he is the executive board member of the foundation Fondo Ambiente Italiano - France. With Pixis, he dreams of giving everyone the chance to cultivate her/his passions and talents. A member of the UN Sustainable Development Solutions Network Youth (SDSN Youth), accordingly to his values, he wants to build a tool that can catalyze education for all, foster personal development and help young people imagine and work for a more meaningful and sustainable world. I’m very glad and honoured to be among the Youth European Awards 2018 innovators. Being part of this group of inspiring projects, gives us strength and energy in order to accomplish our mission as a startup who believes in European Union’s values."